THE DALLES, Oregon — Firefighters from the Oregon Department of Forestry’s Central Oregon District responded Sunday to an escaped debris burn near Tygh Valley. 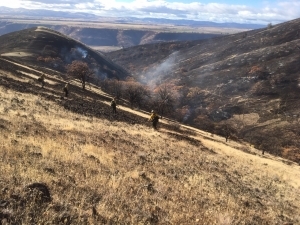 Strong winds pushed the Shadybrook Fire through grass and other light fuels, spreading into oak and brush in some of the surrounding draws. The Department of Forestry was assisted by U.S. Forest Service resources and a dozer from the Oregon Department of Fish and Wildlife. Firefighters from Tygh Valley, Wamic and Juniper Flat Fire Departments also responded to suppress the fire. Fireline was constructed around most of the fire by late Sunday evening and forward progress was stopped. The fire is estimated to be approximately 500 acres in size. There were no structures damaged or destroyed by the fire. Today two five person ODF crews, three ODF engines, two U.S. Forest Service engines and overhead personnel are completing fireline and working to find and extinguish hotspots. Winds are expected to be reduced, with cool temperatures aiding suppression efforts. The Shadybrook Fire serves as a good reminder that while fire season is no longer in effect fire danger can quickly change and caution should be used in outdoor activities. Before burning check with your local fire department or ODF to determine if it is a burn day, if you need a permit, and tips for safely burning. All fires, including campfires and warming fires need to be DEAD OUT! and never left unattended.